Sanders said she was “happy” to sit down with investigators. 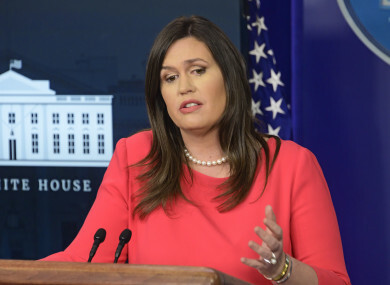 THE WHITE HOUSE Press Secretary Sarah Huckabee Sanders has been interviewed by the team led by Robert Mueller which is investigating potential Russian meddling in the 2016 presidential election, US outlets are reporting this evening. “The President urged me, like he has everyone in the administration, to fully cooperate with the special counsel. I was happy to voluntarily sit down with them,” Sanders told CNN. It is not known at this stage what she was asked, but it is likely she fielded questions on how responses were drafted to questions she faced around alleged Russian collusion. The news comes as Mueller closes in on concluding his almost two-year long probe. Late last month, acting Attorney General Matthew Whitaker said the investigation was almost wrapped up. The report will be delivered to new Attorney General Bill Barr initially. He was appointed special counsel after US President Donald Trump abruptly fired FBI director James Comey that same month. Trump has repeatedly denounced the investigation as a “political witch hunt” and fervently denied there was any collusion between his campaign and Moscow. The president has also dangled the possibility of pardons for some of those indicted, which could include the likes of long time advisor Roger Stone, former campaign chairman Paul Manafort and former national security advisor Michael Flynn. Email “White House press secretary Sarah Huckabee Sanders interviewed by Mueller investigators”. Feedback on “White House press secretary Sarah Huckabee Sanders interviewed by Mueller investigators”.